For consumers purchasing or refinancing a home with less than 20 percent equity or 20 percent down, there's a little-known fee that will apply to the total mortgage payment, effectively inflating the monthly outlay. Mortgage insurance is paid by the the homeowner to insure the lender against future mortgage payment default. Mortgage insurance, also dubbed PMI (an acronym for private mortgage insurance), can easily be several hundred dollars per month depending on the loan program. This added premium makes the cost of homeownership more expensive. However, there is a way to cut your mortgage payment using single-pay mortgage insurance. First, keep in mind that "loan to value," or LTV, is the amount of money being lent against the value of the house. It's computed by taking the loan amount, divided by home value. It's a critical factor in home lending. • Mortgage insurance must be removed by the the lender by law at 75 percent loan to value/25 percent home-equity. 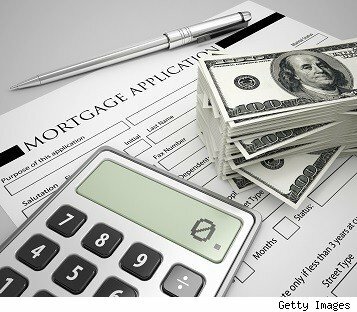 • Mortgage insurance may be removed by the lender at 80% loan to value/20% home-equity (subject to individual mortgage company discretion). • A loan can be refinanced anytime if the lender denies the consumer's request to remove the mortgage insurance. • Mortgage insurance will be required with less than 20% down, every time. • More money down creates lower loan to value, lowering amount of basis points for determining my calculation, thus reducing mortgage insurance payment. What is single-pay mortgage Insurance anyway? It is, in short, an added fee, but with a favorable upside. Most people hate the idea of paying an extra monthly fee without any direct benefit to them. Consumers don't directly receive a benefit from paying mortgage insurance (despite tax deductibility in some cases), other than the ability to secure lower equity financing. Single-pay mortgage insurance allows a consumer to pay upfront a portion of the future mortgage insurance premiums at a discount at the close of escrow rather than financing these monies into their house payment. This improves the ability to qualify by means of a lower debt-to-income ratio, a lower monthly mortgage payment, and a lower cost loan. Let's say a consumer is looking at a loan for $300,000, using 70 basis points of the loan amount to estimate monthly mortgage insurance, $175 per month or $2,100 annually. $2,100 a year for five years adds up fast --$10,500 to be exact! The single-pay choice (using an average 1.75 percent of the loan amount) would translate in this case to $5,250 that's paid one time at closing. In other words, in exchange for more upfront overhead, the house payment is reduced by $175 per month. A consumer would recuperate these monies within just a little more than two years. • Higher upfront overhead required. An average of approximately 1.75 percent of the loan amount would be paid at closing. • The loan would have to be kept for at least the amount of time necessary to recuperate paying upfront overhead; paying off the loan earlier negates the benefit. • The option isn't offered by all mortgage companies, so ask your lender upfront if they offer single-pay mortgage insurance as an option to keeping your new payment lower. Consumer Tip: Further requirements include a middle credit score of least 700 or higher, primary home or secondary home financing only, a max 45 percent debt-to-income ratio and an approval from the lender. Single-pay mortgage insurance offers consumers any easier more flexible way to secure financing and keep the long-term mortgage payment more manageable against a household budget. If homebuyers or homeowners have the equity or cash available, single-pay mortgage insurance makes securing higher loan-to-value financing more manageable as a PMI payment would never be required.